President Rodrigo Duterte flew to Israel for an official visit from September 2 to 5 and will also visit Jordan on September 5 to 8. Duterte's official visit to Israel aims to expand economic, defense and labor cooperation while in Jordan he plans to renew bilateral relations as well. And Duterte was recognized as the first Filipino president to visit the two countries. 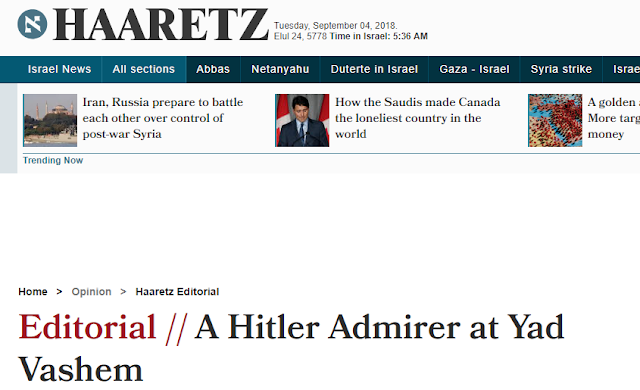 On an editorial column published by Haaretz a top newspaper in Israel, published a column entitled 'Philippine President Rodrigo Duterte has been identified as an admirer of war criminal Adolf Hitler, an unwanted guest, among others' while the first Filipino president is in their country for his official visit. The column tells criticism about Duterte on his continuous fight on drugs and compared him to Adolf Hitler when Duterte made a remark on 2016 that like Hitler who massacred three million Jews, Duterte is also more than happy to slaughter three million drug addicts. Duterte apologized for his remarks thru his spokesperson then, Ernesto Abella, who maintained that the President is willing to kill as much as three million "criminals". 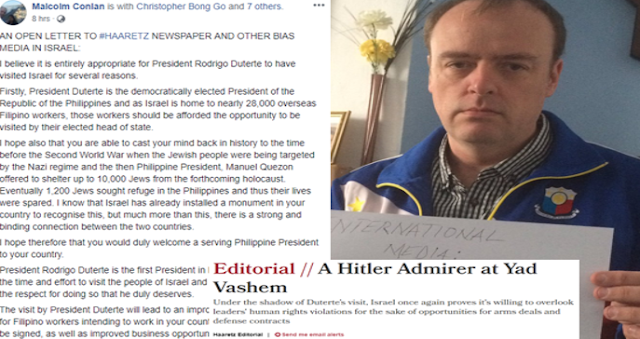 After the said remarks from Isarelis leading newspaper, UK based Pinoy at heart Malcolm Conlan a known solid die hard Duterte supporter wrote an open letter to his Facebook addressing it to Haaretz newspaper and other biased media in Israel, wherein President Rodrigo Duterte deserves the respect and warm welcome from the people of Israel, since most of the Filipinos residing and working in the 'Holy Land' are caregivers and are supporters of Duterte as well. Conlan pleaded to the media in Israel to appreciate the first Filipino president who made an effort visiting the country to show his love and respect to the leaders of Israel as well as showing love to the Filipino community whom had voted the President as well. Lastly, he ended his open letter saying that Israel media should not listen and fact check their resources about President Duterte since many 'fake news' are coming out right now, most especially those that hates Duterte on his cotinuous war on drugs. Many drug lords and politicians are gone now because of this kind of money-making dollars, which biased media says they are victims of human rights. 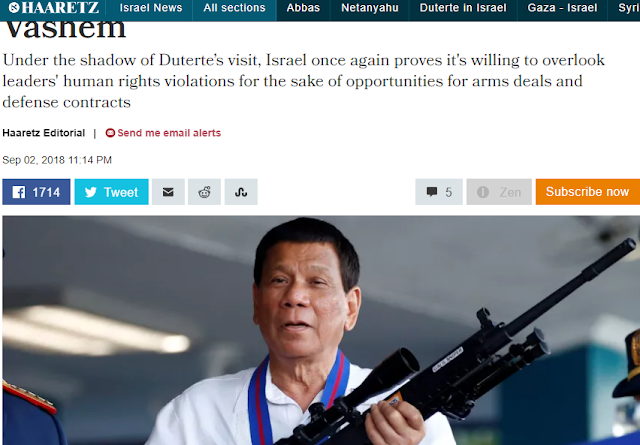 I believe it is entirely appropriate for President Rodrigo Duterte to have visited Israel for several reasons. Firstly, President Duterte is the democratically elected President of the Republic of the Philippines and as Israel is home to nearly 28,000 overseas Filipino workers, those workers should be afforded the opportunity to be visited by their elected head of state. I hope also that you are able to cast your mind back in history to the time before the Second World War when the Jewish people were being targeted by the Nazi regime and the then Philippine President, Manuel Quezon offered to shelter up to 10,000 Jews from the forthcoming holocaust. Eventually 1,200 Jews sought refuge in the Philippines and thus their lives were spared. I know that Israel has already installed a monument in your country to recognise this, but much more than this, there is a strong and binding connection between the two countries. I hope therefore that you would duly welcome a serving Philippine President to your country. President Rodrigo Duterte is the first President in Philippine history to take the time and effort to visit the people of Israel and I believe should be given the respect for doing so that he duly deserves. The visit by President Duterte will lead to an improved recruitment process for Filipino workers intending to work in your country through agreements to be signed, as well as improved business opportunities between the two countries. I believe this visit also shows the outside world that Israel is a key player on the world stage and whilst politicians from other countries around the world have even been anti-Semitic, President Duterte has said that he is very thankful to the people of Israel and I believe this gesture and respect should be welcomed and acknowledged. Finally, as I am sure you have no doubt heard through the worldwide news, there is a lot of fake news and propaganda out there about President Duterte and so called EJK’s which are entirely fake. I am sure the people of Israel are used to fake news and I hope therefore are able to dismiss fake news when they see it. The fact is, President Duterte is in fact a very caring father figure or ‘Tatay’ to many in the Philippines as he genuinely cares about his country and the plight of the Filipino people. I hope that you and other commentators in Israel and negative bias press organisations will afford the President the respect I believe he duly deserves. Foreign Sec Alan Peter Cayetano made it very clear that the Philippines wishes to be friends with everyone and enemies with no one. Hope you and your colleagues can respect that.